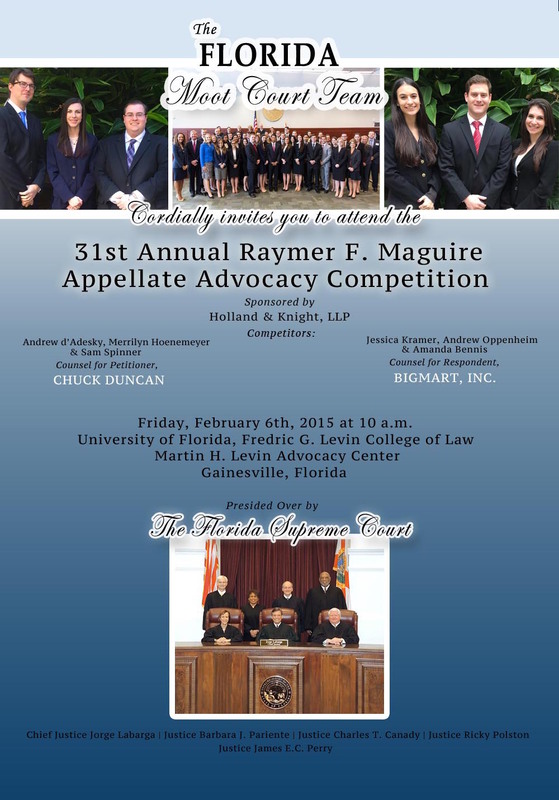 Poster featuring the 2015 Maguire Competition competitors and the distinguished members of the Florida Supreme Court. Justices of the Florida Supreme Court will once again visit the University of Florida Levin College of Law to hear oral arguments in the 31st annual Maguire Appellate Advocacy Competition on Friday, February 6, 2015 at 10 a.m. in the Martin H. Levin Advocacy Center courtroom. The event is free and open to the public. The competition will feature two teams of skilled advocates from the Florida Moot Court Team, who will later compete in the American Bar Association competition. Andrew d’Adesky (3L), Merrilyn Hoenemeyer (2L), and Samuel Spinner (3L) will represent the petitioner, Chuck Duncan. Jessica Kramer (2L), Andrew Oppenheim (3L), and Amanda Bennis (3L) will represent the respondent, Bigmart, Inc.
Is the denial of a 12(b)(6) motion to dismiss reviewable on appeal after a jury verdict for the plaintiff? What is the standard for measuring the sufficiency of a complaint asserting private employment discrimination? The competition is named after Raymer F. Maguire, Jr., son of the founder of Maguire, Voorhis & Wells, P.A., managing partner of the firm, and UF Law alumnus. In the summer of 1998, Maguire, Voorhis & Wells, P.A. merged with the law firm of Holland & Knight LLP, who became a proud sponsor of the competition. contact Jaclyn Clark, Florida Moot Court Team Public Relations Chair at Jaclyn.sara.clark@gmail.com.